At Johns Hopkins—America’s first research institution—learning is multidimensional. 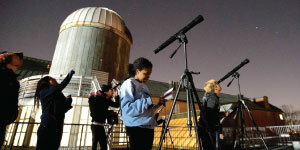 The Hopkins experience is all about exploration and discovery, for all students in every major. It’s a place where ambitious, talented, and creative students thrive. With the freedom to pursue their intellectual passions, the opportunity to learn from academic leaders, and the chance to make an impact right away, students work across academic disciplines and with every subject imaginable. And they do it all with the resources of Baltimore and Washington, DC, at their fingertips, from the comfort of a dynamic and close-knit campus community. You’ll have the opportunity to make your own discoveries and the guidance you need to get there—in groups and through faculty mentorships and internships, study abroad, and the cultural connections of one of the most exciting cities around. Students are able (and encouraged) to build the academic path that is right for them, with guidance from staff and administrators to help them find their way. Many students work on independent projects with professors, mentors, and teams and take advantage of study abroad, internships, and advanced graduate study. 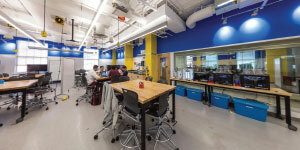 Several resources, like the Hopkins Office for Undergraduate Research, Dean’s Undergraduate Research Award, Provost’s Undergraduate Research Award, and Woodrow Wilson Undergraduate Research Fellowship, are available to give participants the chance to complete projects of their own design. Johns Hopkins has schools, centers, and affiliates throughout Baltimore—most are linked by a free shuttle bus—as well as in the DC area, across the country, and throughout the world. Hopkins students are active and engaged, which makes the Homewood campus an energized place to live and learn. 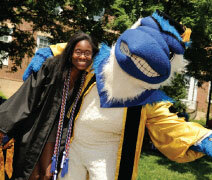 Students come to Hopkins from all over the globe and bring a diverse mix of backgrounds and interests. They get involved in their passions and explore new ventures through more than 400 student-run organizations, from theater and performing arts groups to political and cultural organizations. More than two dozen multicultural organizations are backed by the Office of Multicultural Affairs and receive help planning and promoting events, supporting diversity among the student body, and fostering communication around culture. In addition to 22 varsity athletic teams, one in six Hopkins students participates in a Division III or club sport, and more than half participate in the popular intramural program. Off campus, you’ll find that Baltimore is an extension of campus, where you’ll find endless entertainment options as well as internship, work, and enrichment opportunities.